Ling Hon Lam. 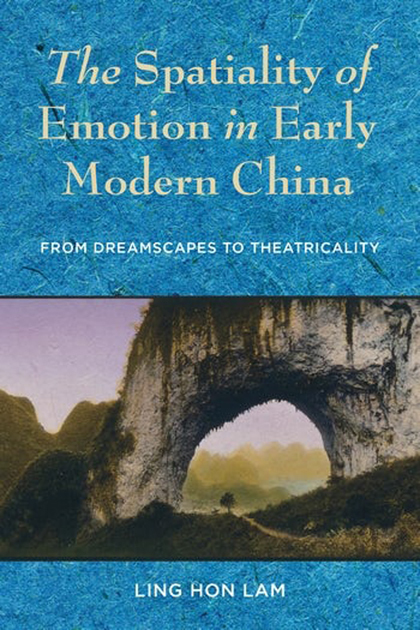 The Spatiality of Emotion in Early Modern China: From Dreamscapes to Theatricality. New York: Columbia University Press, 2018. 360 pp. Some years ago, Gayatri Spivak spoke about the difficulty of discussing Indian politics with a young relative who grew up in the US and the need to boil down the complexity of the local situation when conversing with those outside. In the division of the local and its assumed opposite, in the consciousness of an inside and outside perspective, in the necessary assumption of a lingua franca before conversation can begin, one feels a helplessness over the inevitable loss of density. Likewise, for scholars chiefly interested in dialoguing with theorists, their “local” material—whether Indian or Chinese (my field)—often serves as an example without much historical context. Alternatively, to preserve the density (and to indulge in the ease of conversing in a shared language), many China specialists, myself included, eschew sustained engagement with that thing out there called theory. Not so Ling Hon Lam. Simultaneously engaging Chinese literary history “on its own terms” and on someone else’s terms (Michel Foucault, Martin Heidegger, Claude Lévi-Strauss, Emmanuel Levinas, Slavoj Žižek, to name a few), his The Spatiality of Emotion in Early Modern China offers equally close encounters with both, all the while giving trenchant critique of the very “terms” themselves. This makes for challenging reading, requiring from the reader not just a broad knowledge base (or at least the negative capability for sustained engagement beyond one’s knowledge base), but more important, a suppleness of the mind that follows the author’s constant, dexterous and sometimes surprising turns. The efforts, though, are well rewarded. At the outset of The Spatiality of Emotion in Early Modern China, Ling Hon Lam asks the question: Where does emotion come from? This apparently simple question gets at the heart of major intellectual debates concerning the nature of human feelings, the mutual implication between stimuli from the material world and affective responses, and the spatiality that underlies our self-perception and social relationship. This question then serves as the point of departure for his theoretically bold and historically rich analysis of the emergence of theatricality in sixteenth- to eighteenth-century China. Overturning the conventional assumption of emotion as a subjective state of mind, Lam argues instead that “emotion is the structure of space as an ontological condition without which we cannot even be outside in the world getting along with one another” (p. 5). He advances this argument through four overlapping genealogies: of historical ontology, moral philosophy, theater archeology, and knowledge production. Never losing sight of these philosophical concerns at the core of the project, the chapters give close analysis of Chinese fictional and dramatic masterpieces (such as The Peony Pavilion and The Journey to the West) from startlingly fresh angles. Tracing the transmutation of the medieval dreamscapes to early modern theatricality, the analysis systematically tears down the interiority and self-sovereignty of the feeling subject. Engaging philosophical debates from Zhuangzi to Zhu Xi to Wang Yangming, Lam unearths different layers and modes of spatiality and demonstrates how the history of theatricality has been obscured. A meticulous study of the history of Chinese theater architecture (see chap. 3)—from the roofless stage to passage stage to teahouse theater—gives material demonstration to the advent of spectatorship and the spatial logic of performance and, with a theoretical leap, the spatiality of our very personhood. Such theoretical leaps and comparative excursions frequently accompany deep local excavations. Thus the Chinese tea-house theater is contrasted with the Western proscenium stage, which leads to a dissection of Lévi-Strauss’s misreading of the Noh theater master Zeami’s concept of Vision of a Distant View, and ends in a trenchant critique of the mode of knowledge production in cultural anthropology (see chap. 4). The genealogical approach is well suited to the book’s overall goal of a fundamental rethinking of Chinese literary history, in which “anachronism” all too often “camouflages itself with the illusion of continuity” (p. 145). One example of this approach is Lam’s use of the philological method with which he conducts semantic-textual-historical excavations of key terms. Qing, usually translated as “emotion,” is shown to have a wide range of sedimented meanings. Delving into classical passages from the Book of Rites, Record of Music, “the Great Preface,” and engaging debates among the ancients, the Han philosophers, the Neo-Confucianists, as well as modern sinologists the world over, Lam shows the ambiguity inherent in the Chinese term where “innateness is marked by irreducible exteriority” (pp. 59-61). Another key term, sheshen chudi, literally putting one’s body in another’s situation, is shown to originate from a twelfth century amalgamation of earlier spatial modes of the dreamscape (see p. 224), became imaginatively linked with drama by the sixteenth century (see pp. 124-26) and more generally with poetics by the late seventeenth century (see pp. 87-90). Threaded through a close examination of the late seventeenth century novel The Fortunate Union in its European and Japanese receptions, the concept is further scrutinized by way of the English idea of sympathy in the eighteenth century (see pp. 222-24) and Japanese rethinking on the theatricality of emotion in the nineteenth century (see pp. 177-79). While a good many conversations with Western theory lie buried in footnotes in the first four chapters, they are front and center in chapter 5. Engaging Martin Heidegger, Henri Lefebvre, and a host of contemporary theorists on affect, space, and theater, the last chapter puts forth a critical vocabulary for the earlier chapters' discussion of spatiality of emotion, now dealt with on “their” terms rather than through the Chinese texts. And yet, having engaged so thoroughly with Chinese literary and intellectual history, having immersed the reader in the density of the local, it is by now no longer mere example. It has become "method." The author has led us to experience “being out there with others,” whether ancient or modern, theorists or sinologists.